There couldn’t have been a better setting for Great Britain’s first-ever Olympic dressage medal. The London crowd made their enthusiastic support for their home team known as the British riders completed three exceptional tests in today’s Grand Prix Special. Germany and the Netherlands have had such a stronghold on Olympic dressage that it was hard to even imagine another team breaking through. But Britain’s dressage dream team of Carl Hester and Uthopia, Laura Bechtolsheimer and Mistral Hojris, and Charlotte Dujardin and Valegro were the ones to do it. The victory was only made sweeter by the fact that it followed team gold for Great Britain in show jumping yesterday and team eventing silver last week. Germany and the Netherlands rounded out the team medals with silver and bronze, respectively. 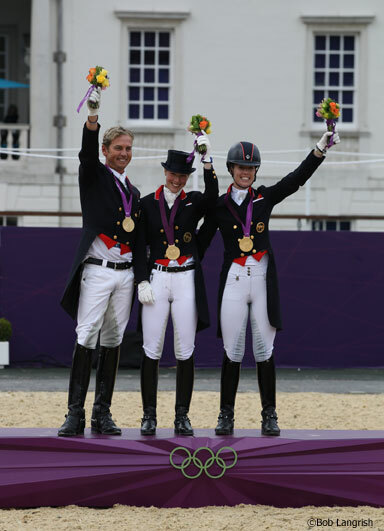 Although Dutch dressage legend Anky van Grunsven did not have her best rides with longtime partner Salinero, this team Bronze did give her a new record as the only equestrian to have won nine Olympic medals. All three British team riders finished in the top five. Dujardin is in the lead individually after earning an 83.286 in today’s test. Teammate Hester is in third with an 80.571. Dutch rider Adelinde Cornelissen and Parzival are in second place with an 81.968. The United States team finished in sixth place thanks in large part to strong performances from the veteran team of Steffen Peters and Ravel. The pair earned a 76.254 today, which was good enough to put them into a tie for seventh place individually. They will continue on to Thursday’s freestyle. Tina Konyot and Calecto V scored a 70.651 in the Grand Prix Special, putting them just below the line to qualify to compete in the freestyle. The third American duo, Jan Ebeling and Rafalca, are also out of the running after scoring a 69.302. Equestrian continues tomorrow with the final for individual show jumping. 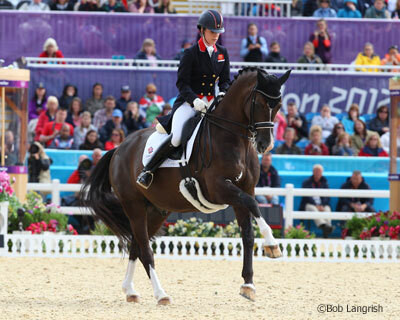 The dressage grand prix freestyle and individual medals will take place on Thursday. Good Luck to everyone. 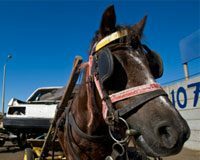 Wonderful horses.